Ps&Qs: Are you coming or what? How could anyone resist sending in this response card from PearTree Greetings? 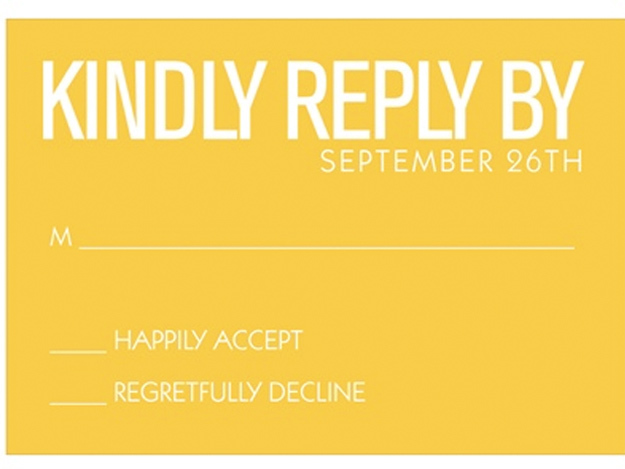 I’m not sure why, but responding to invitations seems to be a courtesy that is falling away. Sure, we’re all busy, but so is the person kindly extending an invite, planning a party and holding a spot for you at a table. We had a party not too long ago and while most responded, there were still a few who did not. Some of those we didn’t hear from showed up (pleasant surprise) and others did not (we get the hint, you don’t want to hang out with us). It was a casual thing so not a big deal either way, but for anyone who has ever orchestrated something that requires a definitive head count, response is important. It only takes a moment, especially with an electronic invite. However, I realize that if I don’t reply when I first view an email or Evite, it tends to get buried in a string of emails. That is until I remember it and sometimes after the requested respond by date. Super bad guest etiquette. Emily Post suggests getting back to your host within a day or two of an invitation. Polite, but also practical so that it doesn’t get lost on the to-do list. For anyone in need of a refresher course, here is the complete guide to invitation etiquette according to Ms. Post. Any outstanding invitations awaiting your reply? Drop your hosts a line today. This entry was posted in Ps&Qs and tagged Emily Post, Pear Tree Greetings by lhouse. Bookmark the permalink. thanks for the timely post, laura! i threw a fiesta for adam’s birthday a while back and was shocked that certain people ignored the RSVP and reminder email. it’s certainly frustrating when you spend time and money to include people and they can’t be bothered. love your blog…it keeps me sane! thanks for checking in nico. and for not making me feel like a prissy old lady for lamenting the importance of the r.s.v.p..